Great accessories of costumes for Legend of Zelda LINK, Malificent, Hobbit Elf, Santa Helper Elves, Leprechaun, Star Trek Spock Vulcan or Romulan, Demon, Genie, Alien, Fairy, LARP, etc. 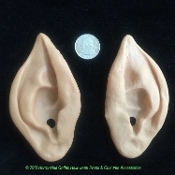 Complete your elfin look with soft PVC vinyl adult size POINTED ELF EARS that fit comfortably over your own ears without the need for adhesives. They're lightweight and flexible, perfect for wearing at Sci-Fi cosplay conventions, Christmas holiday parties, Stage Theatrical events or Halloween masquerade costume party. Just the right touch for role play, dress up costuming mannequin display, etc. Flesh-tone Beige color. Easy to wear and take off. Convenient holes placed so there is little to none hearing restriction. Also great for DIY holiday crafts projects, custom cosplay costume accessories and prop building supplies.